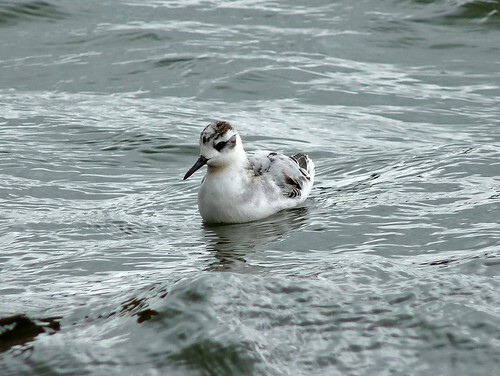 As I mentioned in my Bobolink post on Monday, I had only discovered the existence of Eglwys Nunydd reservoir the day before due to the presence of a relatively long staying Grey Phalarope. I had seen it reported on the local birding pages for at least a week but kept assuming that it was near Cardiff. An idle google search quickly alerted me to my error and I was over there in a flash. Would it still be there though? Well yes it was otherwise this would have been a rather misleadingly titled entry. 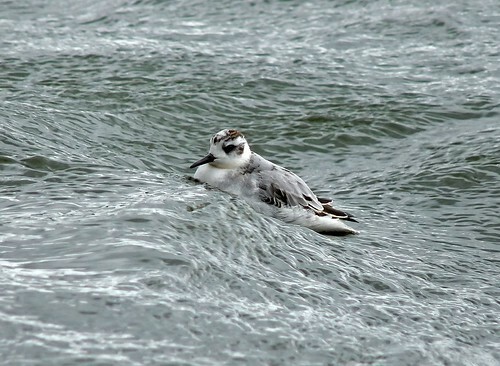 As usual with Phalarope's this individual had no fear of humans at all. And when I say at all I cannot stress how totally unconcerned it was with my presence. I spent most of my time sitting on the concrete apron of the reservoir within a couple of feet of the bird as it busily fed out on the water. I actually made two visits as the first was in the early morning and the light conditions were just terrible for photography. During this first visit the bird was very mobile as it explored most of one side of the reservoir. The second visit was later in the day but still proved to be extremely dull. To top things off the water was particularly choppy which didn't help. The video below should give a good impression of the conditions. It is worth pointing out that the footage isn't sped up and the camera is steady at all times. You will see why I mention those two points when you watch it. During the afternoon we popped into Kenfig NNR for a walk out to Sker Point to look at the high tide roost. 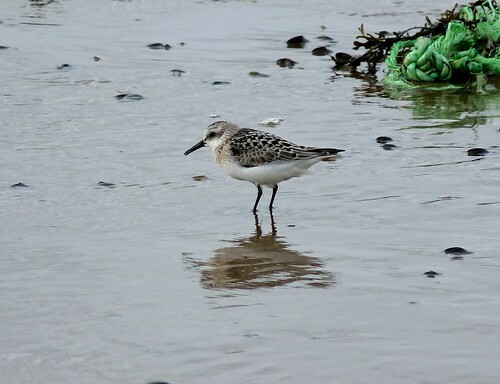 There were plenty of waders about including 38 Golden Plover, 4 Knot, 6 Lapwing, 1 Ringed Plover, 3 Turnstone, numerous Curlew and this solitary Sanderling. Once again though I completely failed to find any of the Yellow Wagtails that are often reported in the fields here. Either I am looking in the wrong places each time or I am just very unlucky. Does anyone know where exactly they are? Grey Phalerope: what a beautiful bird. Certainly is. Don't think I will ever get tired of seeing them.